One reason Family Garden Trains™ has so many articles is that I have had so many mistakes to learn from. 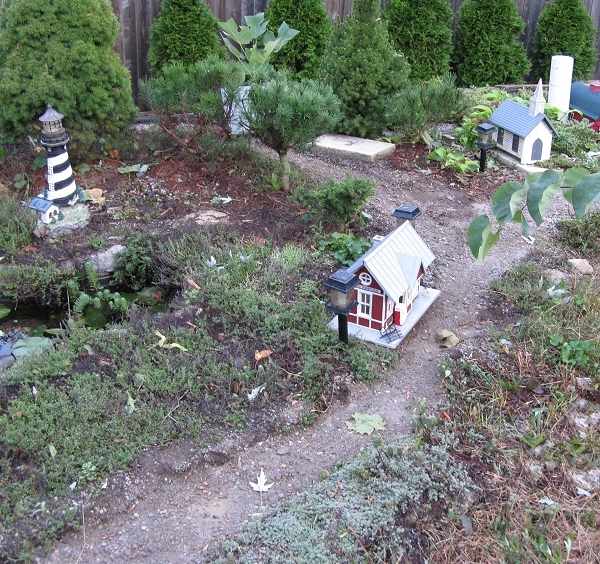 Back in 1998, when I started my first garden railroading project, I made what turned out to be a "biggie," given Ohio climate and wildlife conditions. 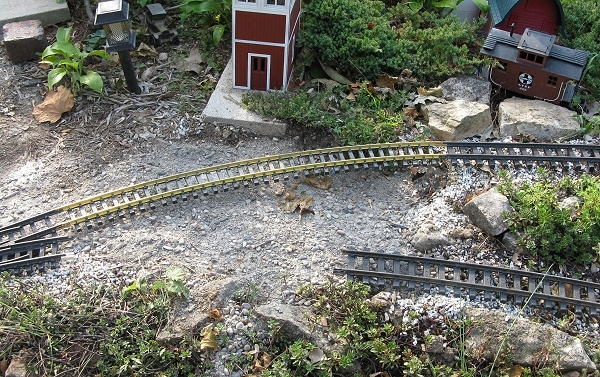 I installed my first loop of track in a way that folks in dryer climates use all the time. Over several years, maintenance problems grew, until I reached a point that some years, I didn't have trains running on that loop at all. I've known other folks who've had similar infrastructure problems after using other methods, so hopefully, this article will be useful to a wide range of folks. If nothing else, it makes a strong case for doing things right in the first place, and gives suggestions for how to fix the problem. 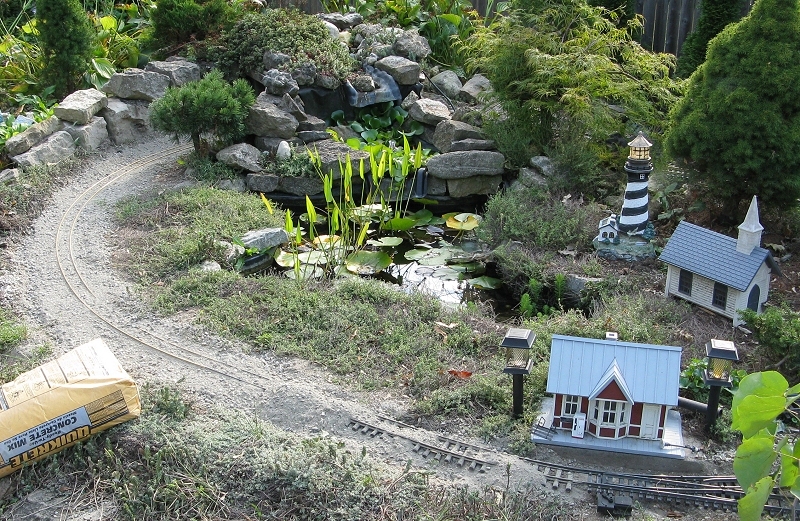 If you've read our Landscaping and Pond Construction, 1998-1999 article, you know that I started out building a terraced, raised rock garden, with a pond in the middle and a train circling the pond. One good thing I did was to choose track that made good mechanical connections (AristoCraft) and to use a "belt-and-suspenders" approach to electrical connectivity. 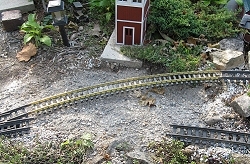 Once I decided on a track plan, I tamped down the soil where I was going to be installing the track, then I tamped down sand and gravel on top of that to create the "roadbed." This seemed to have the advantage of being faster and far less trouble than building a concrete or wooden roadbed. To folks who are already anticipating the problems I encountered, I can only say that this method is featured in many books, magazine articles, and videos on garden railroading. In retrospect, I realize that the folks who recommend this approach live in different climates and with different animal populations. It's also worth noting that my railroad's problems have occurred on other Ohio, Indiana, and Pennsylvania railroads that were built with entirely different methods. 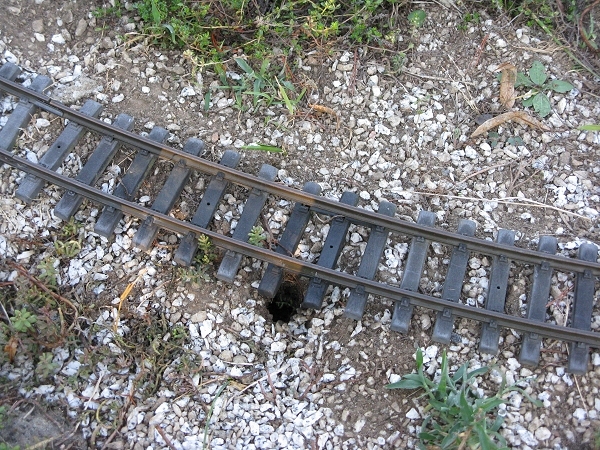 Unfortunately, my railroad's "roadbed" became prone to disruption by weeds, burrowing animals, and, eventually, frost heave. What about Roundup? Unfortunately, spraying the roadbed with herbicide inevitably harms desirable plants, especially plants like thymes that may have sent tiny runners out that you don't notice when you're spraying, but which can carry the poison back to the root of the plant and wipe out the whole bank. What about Weed Barrier? - For a time I fanticized that if I had just laid out weed barrier fabric everywhere, before I had laid my track, the weeds would have been easier to control. In 2006 and 2007, I actually reinstalled part of the roadbed, reinstalling various grades of weed barrier under it, to see how much difference it would make. 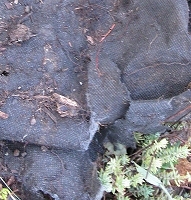 Sadly, even the "best" of the weed barrier fabrics allowed plants to root down through it, and eventually up through it. And when I pulled those plants out by the root, I either tore big holes in the fabric, or I pulled the fabric away from the ground and had to reinstall it and reapply gravel or mulch. Yes, this stuff does restrict weed growth for a season, and slow it down for two, maybe three. But it is not a permanent solution. Note for folks without frost heave: A friend in Sacramento has had good luck with roofing material he laid under his track, although he says he wished he had laid wider layers. I've used roofing material underneath some stepping stones to slow weed growth on a path, and it works, but in Ohio, it rises and falls with the topsoil each winter, so it's not ideal for putting under roadbed. In retrospect, a solid "roadbed" under the track (such as concrete or 2"x6" pressure treated roadbed) would have nipped the weeds-growing-in-the-right-of-way problem in the bud, if you don't mind the pun. That said, folks who don't have many plants anyway, or who live in near-desert climes, don't have this problem, and some folks near me who do just have time to stay on top of it better than I do, so your mileage will vary. 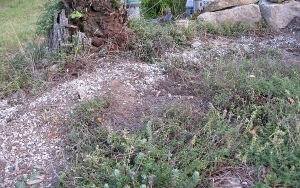 Varmints - Another big problem for me was burrowing animals. Moles, voles, and chipmunks, mostly voles. 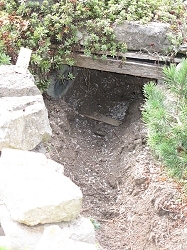 They use the gravel under the track as an "underground railroad," disrupting the level and pitch of the track above it as a result. A side-effect of their incursions was that by keeping the soil under the tracks loose, they increased the effect of frost heave on the sections that they had burrowed under. 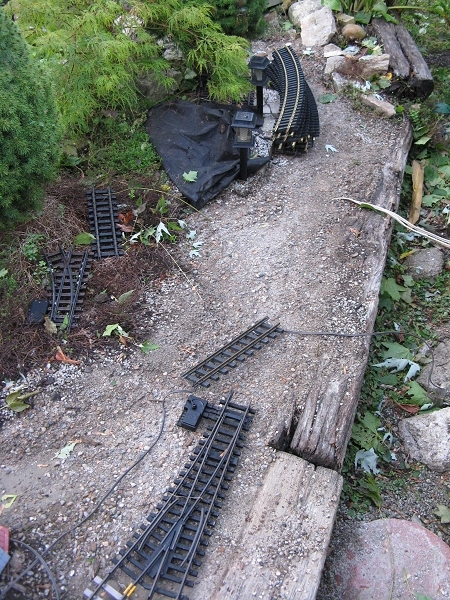 I field-tested any number of mole and vole "solutions," as well as "tricks" for making the roadbed more stable without a complete "redo," but those solutions either didn't work, or they caused other problems. 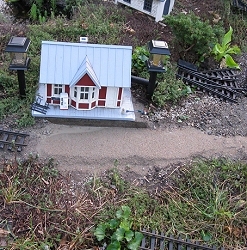 Devise a system for combatting frost heave, such as putting the railroad on posts that drive below the frost line. That's a practice I frequently recommend these days, but one I didn't feel equipped to do back in 1998. Choose a track-and-roadbed solution that is rigid enough to rise and fall in a unit as track heave occurs. In my case, I partially relied on the fact that the AristoCraft track system is fairly rigid when it is installed. The first two or three years, it did rise and fall as a unit. Unfortunately, the Aristo rail joiners can get a little "sloppy" over the years. As other factors undermined or bumped up parts of the right of way, the track eventually conformed, somewhat at least, to the uneven topography eventually. What the varmints and frost heave taking turns raising my railroad, the south loop of my railroad was eventually, but "permanently," raised between one and three inches. 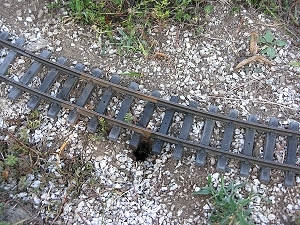 There were now "drops" where that loop intersected with the rest of the railroad, as well as many places where the track tilted outward on curves. 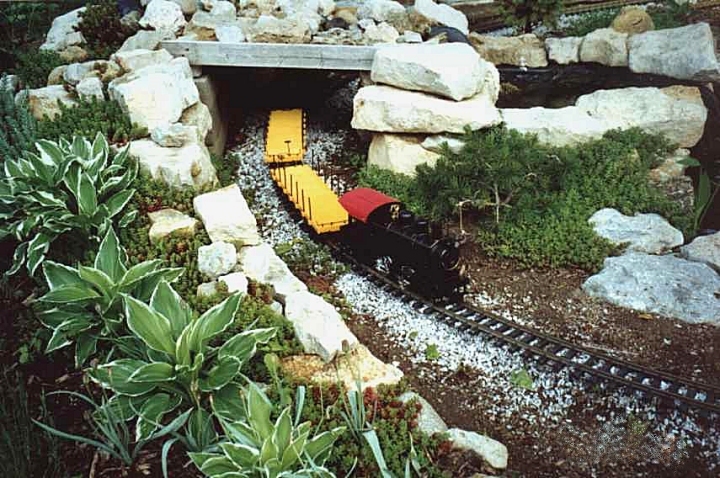 My taller trains wouldn't run through the tunnel unless I raised the tunnel roof every spring (not an easy task). And my longer locomotives would not navigate certain sections at all. 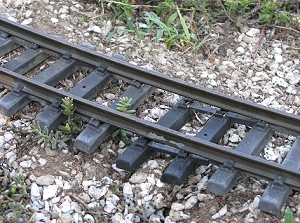 The photo to the right shows a section where the animals had pushed the trackage and underlying weed fabric on one section so high that it would no longer couple to the rest of the track system. What you can't tell easily from the photo is that the "mainline," which runs through the two wide-radius turnouts drops about two inches between the main part of the loop and the lower edge of the photo. 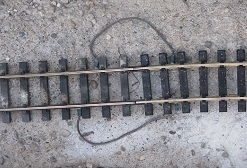 Other Issues with Uneven Roadbed - When the roadbed gets "bumpy" and there are depressions under the track, too much vertical pressure on the tie strip will cause ties to pull away from the track, and it's hard to get them on right again without either damaging the ties or else uninstalling and reinstalling the track. This problem is almost nil in new track, but by the time your track has been down for ten years, it starts to become noticeable. In August, 2008, I pulled up all of the track that I laid in 1998-99. 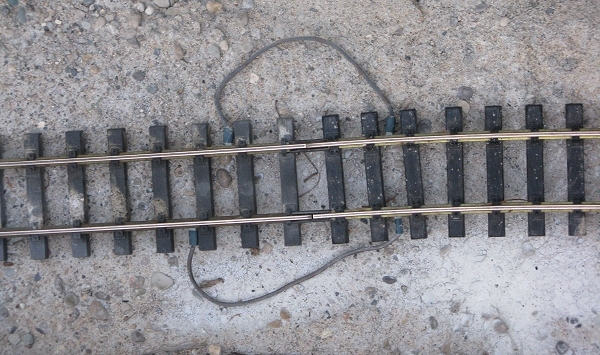 Since it wasn't nailed or screwed down, removing it mostly entailed disconnecting the jumper wires and unscrewing the Aristo tie plates which held the pieces of track together. 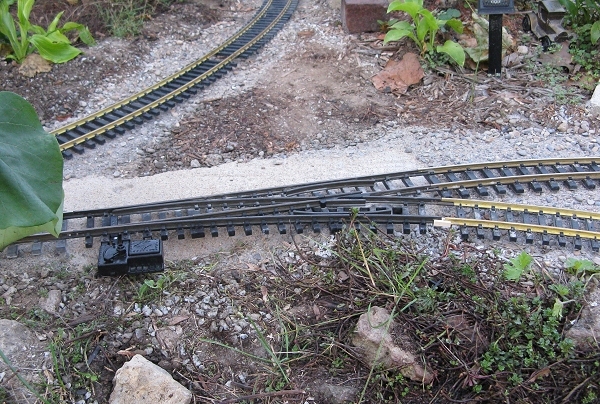 I had another loop of Aristo 10'-diameter track that I used for train shows and clinics, so I figured I could use that if the ties didn't come back before I was ready for the track. (They didn't, by the way, though they did come eventually.) Hopefully you can see why I decided that, while I was rebuilding the roadbed, I figured I might as well make provision for refurbishing the track as well. As you can see in the photo to the right, what should have been a smooth "roadbed," (and was for several years), has been converted into a roller coaster for rodents. Then I got out the "ditch shovel," an off-brand $15 investment I made when I needed to run a power line underground several years ago. The blade is only about 5" wide, so you don't move a lot of dirt at a time, but you don't disrupt as much as if you use a "real" shovel. Digging Ditches - I proceded to dig out the 40+'-area that comprised the first loop of my railroad, including the sidings and the connections to the rest of the railroad. I could tell when I was digging under where the roadbed ran, because the soil was nice and soft and loose, thanks to the vermin. 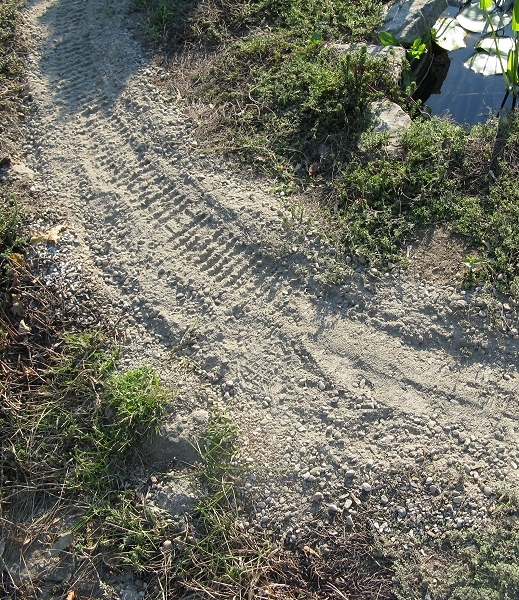 As soon as I got "off the path," I could tell, because the soil there was like concrete. That said, I dug my trench about 6 inches wide because I wanted to be sure that if the relaid track wasn't quite on center, it would still be on a more solid footing than it had been. 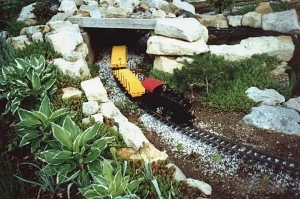 If you think these photos look a little "desolate," consider than the one to the left shows the same area as the photo with the little 0-4-0 hauling the yellow flatcars near the top of this page. Frankly, I found it a little disheartening to see this phase of the work. 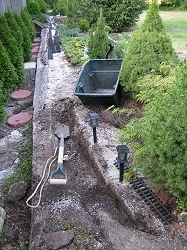 Installing Concrete - My next phase was to fill the trenchs I just dug with concrete. Because I don't really like working with wet concrete, and I didn't have wheelbarrow access to most of the south loop anyway, I dumped Quikcrete mix in dry then wet it down a bit at a time. It seems to have cured hard enough to discourage vermin and to stay stable for quite some time. 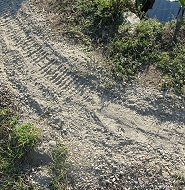 As the photo to the right shows, the resulting paths look more like sand and gravel than they do cured concrete. 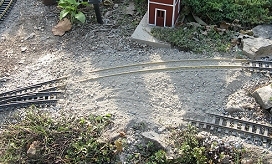 I can't help thinking they look a little like old gravel roads - a possibility for additional modeling when I get the rest of the railroad functional again. The trench/concrete ROW widens in front of the church at the right because a turnout goes there. Through most of this stage, I tried to smooth the concrete mix so that it was about the height of the adjacent earth, which was the original plan for my roadbed way back when. 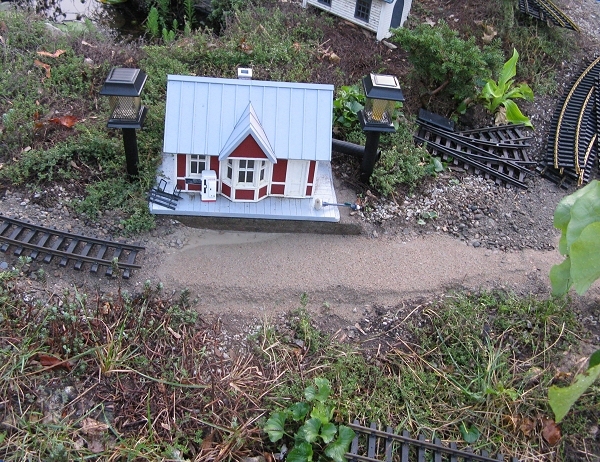 I left some of the 2"x8"x16" stepping-stone/station platforms in place to help me gauge the right depth as well. 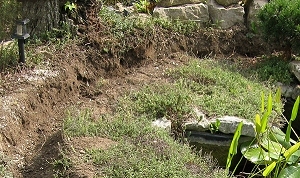 The photo at the right shows the same section as the photo with the ditch shovel above (though it is taken from the other direction). Tweaking - Next, using my "clinic" track, I temporarily relaid trackage to determine where I needed to add more concrete to smooth or level things out. 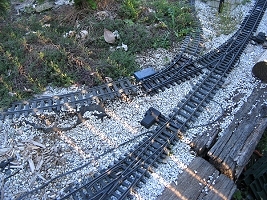 I also "cannabalized" a couple "spurs" on my railroad that I could live without until spring. Near the top of the photo at the right, you can see some US-syle 10'-curves I brought out to work with. 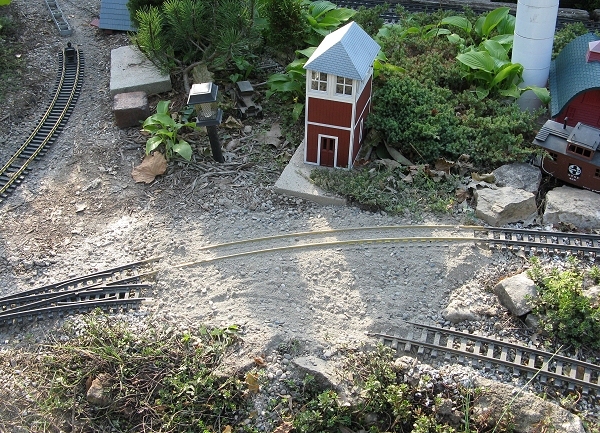 The "south loop," it's sidings, and the pieces that connect it to the rest of the railroad involve about 42 feet of track. I left two turnouts out of the "track plan" because they're getting borderline, too, and I don't really need them to operate the basic loops I want to run this fall (and maybe winter). variations. Laying that much track, even temporarily, took a few hours. I had to screw several of the Aristo pieces together because they kept pulling apart while I was experimenting with various configurations. This is a valuable lesson. Back in 1998, I plotted the original course of this loop by using a 2x4 as a compass around a central point, something that is pretty tough to do once a waterfall and several trees are "installed." Getting a nice level roadbed was a lot easier then, too. If I had simply dug a trench and filled it with concrete instead of tamping down the soil, things would have been much less complicated later. After I got a track configuration that seemed effective, I dumped dry Quickrete concrete mix over the whole south loop, except for around the turnouts. At first, I swept the concrete mix down until I could see the rails and make certain there weren't any eggregious bumps or twists. The effect was actually kind of cool - I've heard of folks setting their rails in concrete to replicate a city street installation, and I could see why it has an appeal. Of course, I wasn't going for that look, and if I was I'd be a lot more careful about how high the concrete came between the rails, but the photo at the right shows you the general look. Then I swept the concrete mix down to where I could see the top of the ties as well. I took a level and went all the way around trying to make certain that there were no unnecessary grade changes. Where necessary, I pulled the track up and packed more concrete mix beneath it. 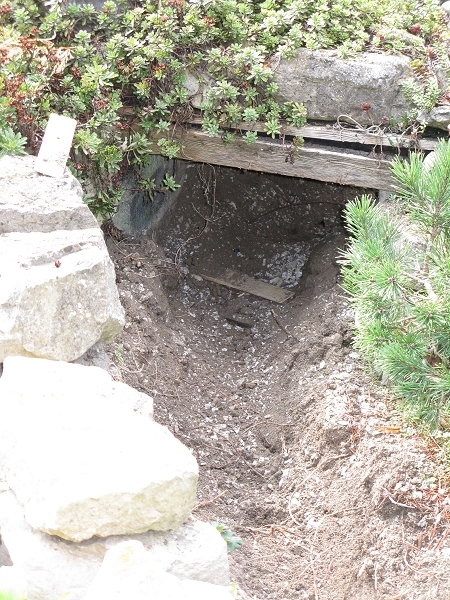 The photos below show a section under which my first concrete backfill left a huge gap. The photo on the right shows the same piece with concrete mix "filling in the gap" and ready to provide a semi-permanent support once the track was removed again and I could soak gently it down. When I was satisfied that I was within a half-inch of where I needed to be, I pulled the track up, set it aside, and rinsed it off to keep the concrete mix from getting damp and setting on it. I then gently smoothed the "tie pattern" out of the concrete "bed," trying not to affect the level or pitch any more than necessary. The photo to the right shows some of the roadbed smoothed out and other bits that haven't been smoothed out yet. By the way, you're better off smoothing the concrete out too much than leaving anything poking up. After the track was all taken up and the roadbed smoothed out, I use a mist setting on my garden hose and soaked the top layer of concrete down without "blowing it away." When that layer had set overnight, I went back and, using a level, filled in under where the turnouts would go. In the photo to the right you can see that I had run out of concrete mix temporarily and was using sand mix, which is almost as good in this application. 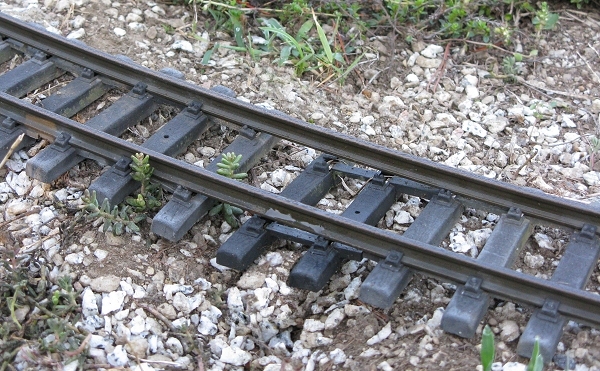 Why handle the turnouts differently from the "regular" track? Because any bit of grit that gets into a turnout causes problems. Grit that has a chemical bonding compound built into it is exceptionally dangerous. Of course, I wet this down gently and let it cure as well. Track Re-Installation - After I had the track within an inch or so of where I needed it, I brought the track back in and screwed it together as firmly as possible with the AristoCraft railjoiners. Since this was mostly new track, it made a pretty solid physical connection. I also re-ran the jumpers I had before. As the photo to the right shows, I use lamp cord and solderless lug connections. What you can't see is the connections screwed to the bottom of the Aristo track by the tiny screws they supply to keep the tie strips from sliding along the rails. In a few cases, I jumped several pieces with longer wires that I didn't split apart like this wire. Lamp cord has a ridge, or "bead," down the insulation on one conductor, so you can keep the polarity straight. In my case, I keep my sanity by always putting the conductor with the bead on the "outside" of the my ovals. On the other hand, all was not perfect in Paradise. Once the track was really bolted together, it actually wanted to sit a little farther out towards the edge of my "terraces" than it had before. I can adjust around this, so I'm not too worried. Cleaning and Inspecting the Track - The next thing I did was to walk all the way around the mainline with a very fine 3m sanding sponge, hitting the top and inside edge of the rails. 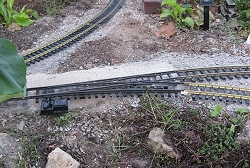 This also allowed me to visually inspect the rest of the track to see if it would be safe to run a locomotive around to test my connections. Parts of the wooden roadbed section had gotten a little uneven, but that was nothing to what I'd fixed already, so I made a note to adjust that part later. Finally, I brought out an Aristo 0-4-0 and a small power supply, hooked up the power supply, set the locomotive on the track and watched nothing happen at all. By then it was dark so I came in, figuring that, worst case, I had probably wired a jumper backwards. Testing and More Tweaking I had. The following Sunday afternoon, I tracked down the erroneous jumper and rewired it. I then ran the locomotive around the railroad slowly, adjusting obstacles it encountered, and using my stash of Grani-Grit "Developer Layer" chicken grit to tweak the slant of the track or to fill in where the track was "hanging in mid-air." I didn't have enough grit to ballast the whole railroad right then, and that is almost pointless before the leaves fall, but I wanted to make certain the railroad was at least as smooth as it was the last time I had things running. After the worst dips and slopes were "tweaked," I attached an Aristo Sierra-style coach and started all over again. 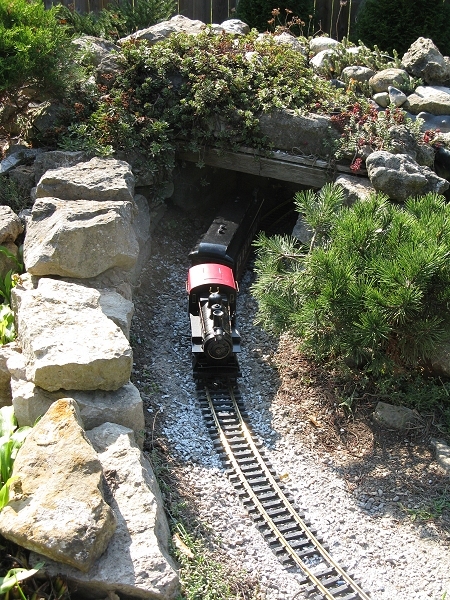 The coach requires more clearance than the loco, so it snagged on things that didn't bother the loco. It also uncoupled on a few track "dips" that weren't all that noticeable when the loco was running by itself. Finally, I strew a little more "ballast" around the front edge of the railroad for cosmetic purposes, took a photo, and went inside. 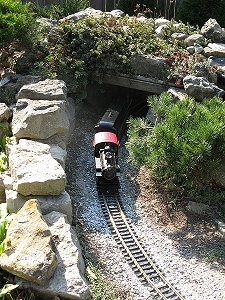 I made a point of using the 0-4-0 so I'd have a photo you could compare with the one at the top of the page, taken about 2002. 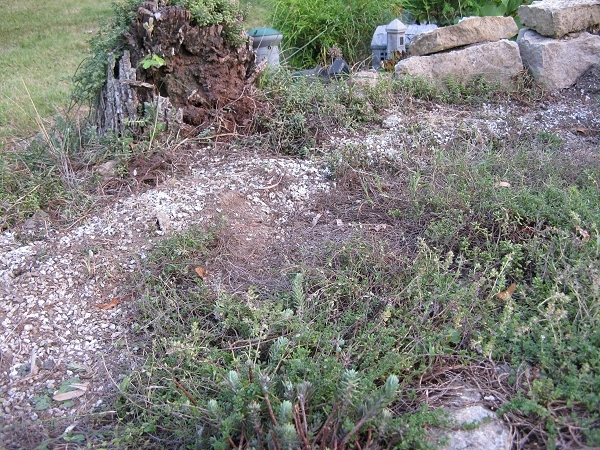 You might notice that both the Mugo pine and the rock wall have grown taller. So the 0-4-0 looks smaller as a result. The 2-8-2 should look great, though, don't you think? What's Left to Do? - I still need to tweak the roadbed in several other places, including shimming up the wooden roadbed in one section. I also need to trim back some conifers that are crowding the right of way (I think a Dwarf Alberta Spruce knocked the bell off the 0-4-0; I'll have to go looking for it again). 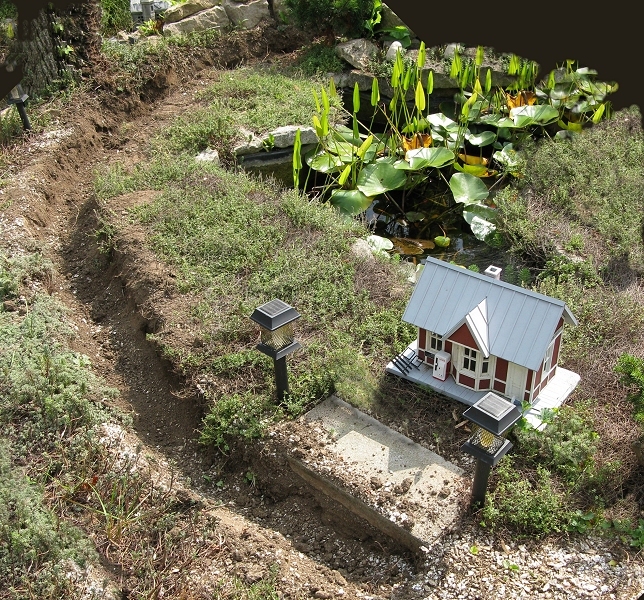 I am so pleased with the overall effect, though, that I may extend this process to the lower loop, which has not suffered from frost heave or animal invasions to speak of, but is prone to weed problems. Next spring, I'll bring out the really big trains and do the additional tweaking that will be necessary to get them to run well on this track. But that will be nothing like the work I've done so far. Above all, though, I plan to run trains this fall and maybe into the winter. If you are ever heading toward southwest Ohio, contact us and I'll tell you if I have any open houses scheduled. I hope to have a couple a year from now on, now that I am close to having my railroad back. Amount of weeding and other maintenance necessary to keep the ROW open and smooth. Enable earlier running each spring. It would be so nice if, the first pretty day of next spring, I could run a train without having to spend three weekends on my knees for a change. Yes, I'll still have to cut back thymes and junipers, but that still beats pulling thistles and maple seedlings. 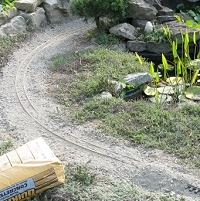 What Would I Do Over?If I was starting a new railroad, I'd be inclined to use the "simple, raised roadbed" (2"x6" construction) for everything and backfill AFTER the roadbed and track were in place and tested. That's the way Paul Busse, a pro, used to do it for professional railroads, but that seemed like too much work when I was starting out. Find out what folks in your area have done with success, though - you might be fine with the same approach that was "less than optimum" for me. If you would like to add anything or correct anything in this article, please contact me. Rehabilitating the Geologically Improbable Railroad From George Shreyer's Large Scale Trains Page. 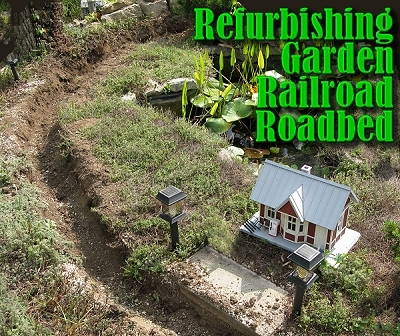 George reviews things he needed to repair, replace, or rework after a period of neglect on his outdoor railroad. I have the 2X6s under my entire railroad (excluding trestles and bridges). It does "pop up" during the winter; one year up to an inch and a half. However, it settles right back down without any issues and seems to move as a unit. We have been laminating 1X6s instead of the 2X6 method, but we've been using this method for over 15 years. I'll probably use the same method to build the next railroad.